Founded by Tehaumate Tetahiotupa (former Mayor of Tahuata) and AFAR President Barry Rolett in 1987. 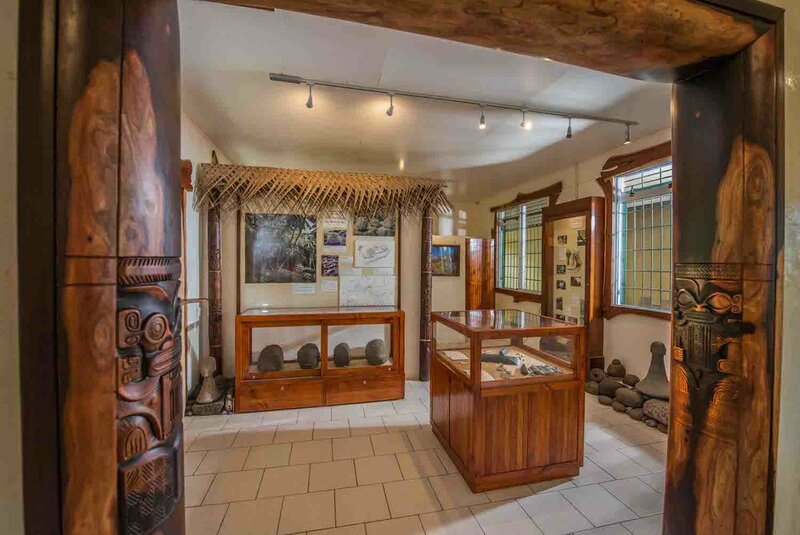 Located in the center of Vaitahu Village, Te Ana Peua is the first community-based archaeology museum in the Marquesas. Fishhooks, stone adzes, whale ivory ornaments and tattooing needles. These are among the beautifully preserved and visually striking artifacts directly linking the island’s modern population to ancestors who inhabited Tahuata for over 600 years before the arrival of Captain Cook. Te Ana Peua’s core collection consists of artifacts from excavations at the Hanamiai dune and monumental architecture sites in Vaitahu Valley. Directed by AFAR President Barry Rolett, these excavations involved youth from the local community as well as university students and volunteers from the United States, Canada, and Europe. 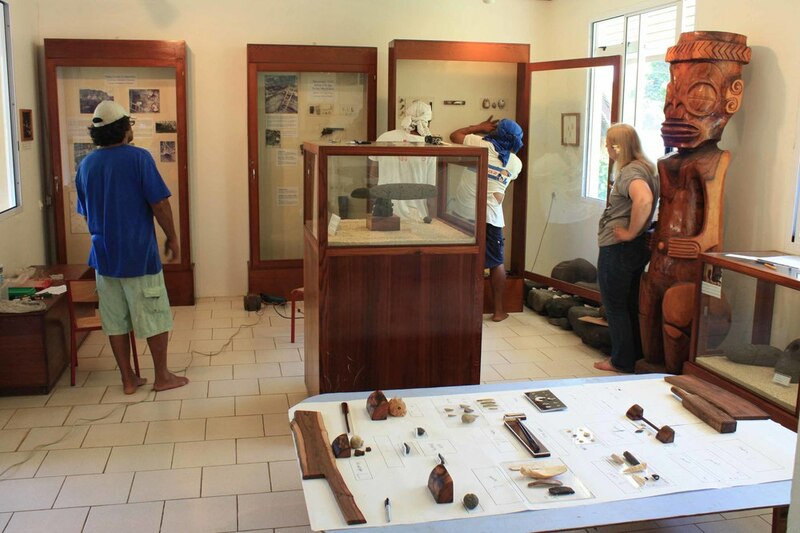 The Museum is a collaborative effort of the Marquesan community and the archaeologists. Displays feature interpretive labels written in Marquesan (still the everyday language on the island) with translations in English and French. Current exhibits develop two main themes: Marquesan origins and the evolution of Marquesan culture. The exhibits also explain archaeological research methods, with action photographs depicting our excavations on Tahuata. Open house following the 2016 museum makeover. Carved posts sculpted by local artist Fati Fii adorn the entry to Te Ana Peua's second gallery, completed in 2017. Photo by D. Hazama. For ten years (1987 – 1997) the original museum vitrines lined walls of the town hall. Then in 1998 the community dedicated one room of its new post office building to establish the museum as a separate entity with its own private space. To celebrate this event, there was a dedication ceremony at which the mayor gave the museum a Marquesan name: Te Ana Peua. Te Ana Peua (“the open cave”) refers to the traditional Marquesan practice of depositing the remains of important people and their possessions in secret burial caves. Unlike burial caves, usually hidden among steep cliffs and always strictly tapu, this cave of treasures is open to all. Hawaii KGMB Nightly News Broadcast. A Museum for the Marquesas. Te Ana Peua’s total collection of more than 1500 artifacts was assembled over a period of 30 years and it is still growing. In 2016 and 2017 we added five new vitrines and 250 ft2 of new gallery space, together with new exhibits and new lighting. These improvements were timed to take the Museum to the next level in preparation for December 2017 when will host Matavaa, a biannual Marquesan performing arts and cultural festival. The local community feels a deep connection with Te Ana Peua. The artifacts are not viewed simply as curiosities – they represent the island’s cultural patrimony. While the seven tikis are treasured as rare works of art, many in the community still consider them to possess the mana and supernatural powers for which tiki are legendary. Revered and feared. This magnificent Janus-figure tiki, only 20 cm tall, was hand-carved from a single block of basalt. Within months of bringing it home, the islander from Hanatetena (Tahuata) who accidentally discovered it became partially paralyzed and his family was smitten by misfortune. Tiki with apparent supernatural power are believed to be alive, while others are thought to be asleep or dead. Modern peoples are awed by the simple sophistication of ancient Polynesian technology. See the "treasure of Tahuata". Teiki Barsinas and a team of local artists carved this massive tiki by hand. It is made of Polynesian tou wood from a trunk nearly five feet in diameter. Aesthetic qualities of the Museum’s archaeological specimens stimulate creativity among contemporary artists. A photo history of Te Ana Peua. Since 1987 the Museum has evolved from a set of three vitrines lining one wall of the town hall to a series of galleries in a separate dedicated building. 1987. T. Tetahiotupa, B. Rolett and T. Teiefitu upon completion of the original three display cases. These exhibited artifacts from the first archaeological excavations on Tahuata. 1998. The community dedicates one room of its new post office building to establish the museum as a separate entity with its own private space. The museum is formally named Te Ana Peua. 2010. AFAR and the Tahuata community collaborate for the first major changes to the museum since 1998. In action: Ren MacDonald, member of the 2010 field school. 2010. The post office moves out and Mayor Felix Barsinas dedicates the entire building to the museum. Gallery space is doubled. 2010. New exhibits are added for the first time in 12 years! In action: Wendy Leicht, member of the 2010 field school. 2013. Design and planning for the "Treasures of Tahuata" exhibit. In action: Michelle Kim and Emily Lowe. 2013. Mounting fishhooks for the "Treasures of Tahuata" exhibit. In action: Joseph Barsinas and Shingo Suzuki. 2013. Mounting the "treasures of Tahuata" exhibit. In action: Manuhi Timau,Samuel Tiaiho, Hio Timau and Maryjane Sherwin. 2013. Samuel Tiaiho and Hio Timau mounting the "Treasures of Tahuata" exhibit. 2013. Samuel Tiaiho, Manuhi Timau, Hio Timau, Barry Rolett and Joseph Barsinas with the completed "Treasures of Tahuata" exhibit. 2016. One of our new custom order display cases is delivered to Vaitahu. 2016. Eric Kjellgren and Barry Rolett mounting a new tiki exhibit featuring four stone heads discovered during AFAR excavations in Vaitahu Valley. 2016. Local artist and Te Ana Pua museum intern Felix "Fati" Fii carves a pair of tiki for the entryway to our new gallery. 2016. We draw upon our rich collections for a new exhibit on the art of pearl shell manufacture.